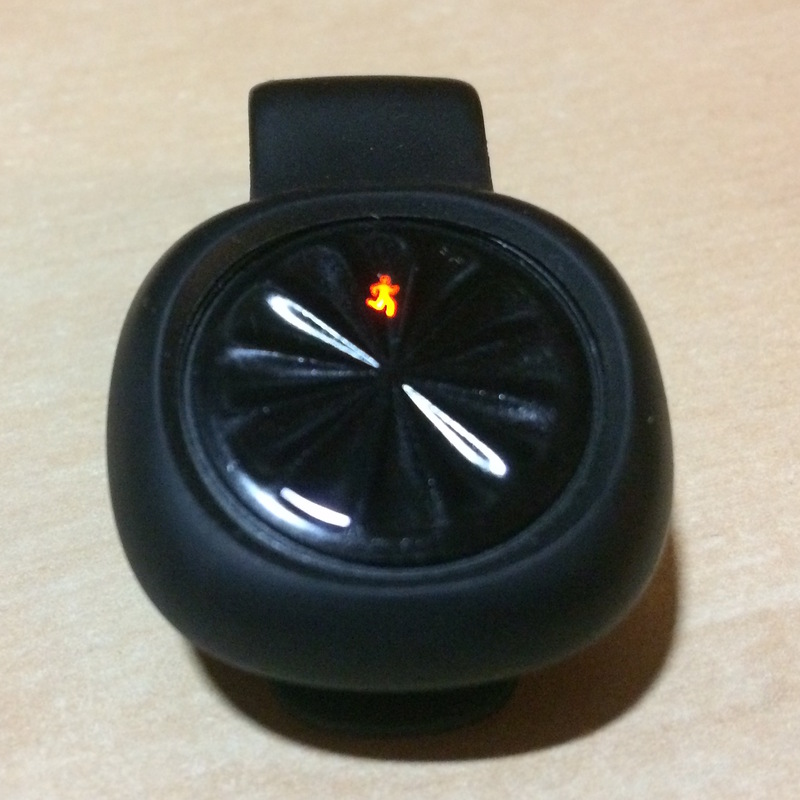 Review: Jawbone UP Move – Sanspoint. 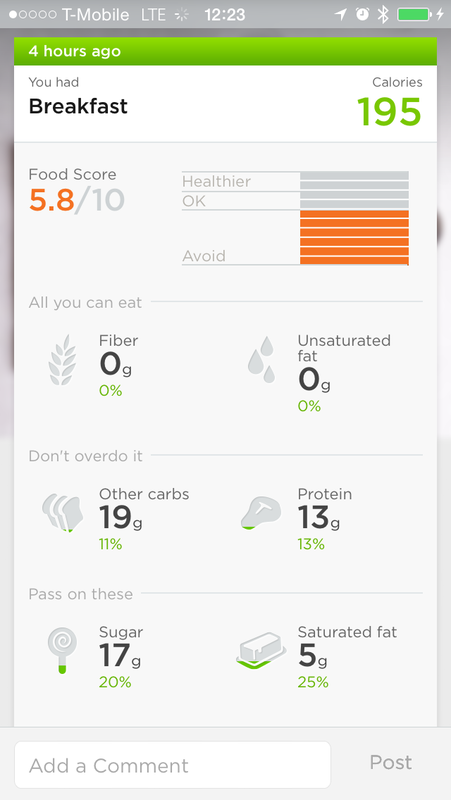 While iOS 8 rekindled my interest in self-tracking, the bugs in Health.App held me back. 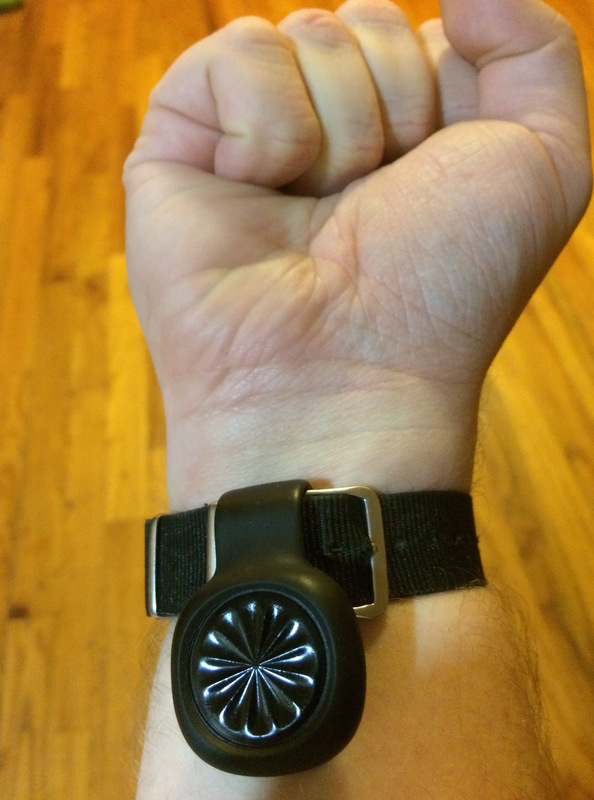 If I was going to make any headway in fitness tracking, I’d have to find another solution—a standalone tracker. Unfortunately for me, most of the fitness trackers on the market are wristbands, which is exactly what I don’t want. I keep a watch on my wrist, and wearing both a watch and a tracker—even on different wrists—seemed like too much. Plus, the majority of the better ones are ugly, better suited for the gym than the wrist of a desk jockey. I could have gotten another FitBit One, but after losing two of them, and with FitBit’s unwillingness to support HealthKit, I wanted another option. While I thought it over, Federico Viticci turned me on to Jawbone’s app ecosystem. 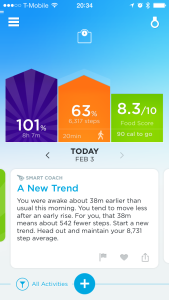 I was intrigued by Jawbone, and even used the Jawbone phone tracker app on my iPhone for a time, but issues with HealthKit made it an exercise in frustration, instead of just exercise. Then, Matt Birchler convinced me to try the Jawbone UP Move . At $50, it’s cheaper than a FitBit One, which is great for such an easily losable device. (In fact, I’m on my second UP Move, having lost the first one inside of a day. Something I did with my first FitBit, too.) It tracks steps and sleep, integrates with a host of fitness apps I use, and it actually looks pretty nice for something that stays clipped to the change pocket on my pants. I’ve been using the UP Move for a month, and I’m happy with it. The ecosystem is its greatest strength. Unlike FitBit, which is very self-contained, Jawbone’s software connects with a ton of great apps, and with HealthKit. There’s currently an issue keeping it from writing step data to Healt.App, but sleep tracking works. 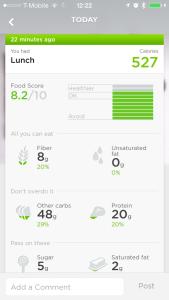 It also works well with myFItnessPal, my food tracking app of choice. 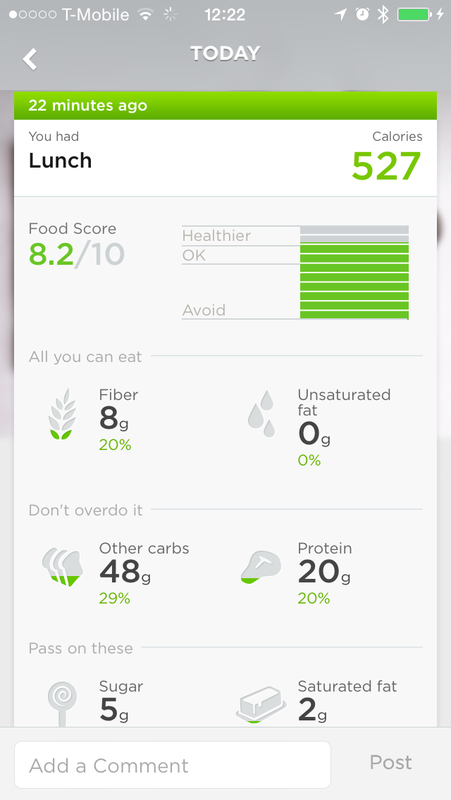 The Jawbone app gives you a Food Score based on the healthiness of meals you eat, and it would be easy for them to only provide it for foods you add within the app. Instead, it also provides the score for meals through myFitnessPal, giving me the power of MFP’s vast food database, and Jawbone’s own nutrition tracking. There’s also the great UP Coffee app, which I use to track caffeine consumption and its effects on sleep. UP Coffee is a little buggy, and has no HealthKit support, but it does the job well enough. 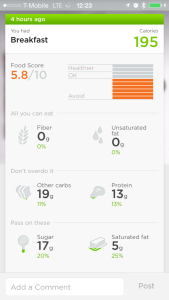 Another great part of the Jawbone software is the Smart Coach. Finally, a fitness tracker is using the data you feed it to make suggestions on behavior. Smart Coach offers up reasonable goals for me to meet, based on my previous activity. These range from going to bed at a reasonable time, to eating a certain amount of fiber in a day, or making a step goal. At first, due to the questionable data in Jawbone’s database from HealthKit, Smart Coach set me up with extremely low goals to reach, but it’s improved in the past month. I’m sure it’ll only get better the more I use it. The best part of the UP Move, though, is the battery. I had to charge my FitBit weekly, using a clumsy USB dongle. The UP Move uses a standard watch battery, which should last six months according to the company. This is huge. Not having to charge my damn tracker means I don’t have to worry about forgetting it on the cradle, or losing data because I was out too long with a low battery warning. It might be a chore to pop the UP Move out of it’s rubber clip to replace the battery, but I won’t have to worry about that until summer. Of course, there are a few issues, some of which I touched on above. Like all clip-on wearables, it’s easily losable. I’m already on my second, and I nearly lost its replacement a few days in while leaving home on a weekend walk. For sleep tracking, Jawbone offers an overpriced rubber wristband, which at fifteen dollars, is 30% of the cost of the tracker on its own. As a workaround, I clip it to my watch wristband when I go to sleep. So far, it seems pretty accurate. There’s also some annoying software bugs, including the aforementioned Health.App integration, and issues with displaying graphs. I’m sure these will be ironed out in time. There’s no issues I have with the hardware, except that the lights are awful bright if you trigger them in a dark room. I’m glad I’ve opted for a dedicated device for fitness tracking over using my phone. It reduces the number of failure points: battery drain, app issues with HealthKit, leaving my phone at my desk. It also does just one thing: tracking my activity. The UP Move doesn’t try to be a smartwatch, vibrating when I get a phone alert, or other nonsense. I can be sure that as long as my UP Move is clipped to my pocket, I’ll never have to worry about Health.App flaking out and losing my data. That alone is worth $50, if I’m dedicated to tracking my health. I’ve already dropped the 10 pounds I gained over the holidays, which is a good start.